I haven’t had a chance to read the book, so I can’t comment on it. If any of you have, please feel free to post a comment. PHP5 CMS Framework Development – Chapter 6 Access Control. 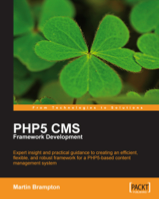 This book guides you through the design and implementation decisions necessary to create a working architecture for a PHP5-based content management system. Each of the major areas and decision points are reviewed and discussed. Code examples, which take advantage of PHP5’s object oriented nature, are provided and explained. They serve as a means of illustrating the detailed development issues created by a CMS. In areas where the code is too voluminous to be reproduced in detail, the design principles are explained along with some critical pieces of code. A basic knowledge of PHP is assumed. This is a very good book, actually one of the best recipe books I’ve read period. You can tell that the authors are still actively writing code – you can feel it as you read the chapters. The book list a series of techniques (they call recipes) that are commonly needed by php programmers. … this book is packed with all kinds of php goodies. I never list too much from a book … you can easily look it up online. After a brief introduction, each chapter provides a bunch of micro-tips related to the recipes discussed in the chapter. They call these tips: ‘quick hits’. I found the ‘quick hits’ to be very useful because they provide a very concise and easy to read look at aspects of the php language. I can see myself referring to this book often just because of the ‘quick hits’. I actually keep this book nearby to flip through once and a while, just to give me ideas. It has already helped on a php 5 project I am working on. This I think is a great book. It has lots of practical information and is without a doubt, one of the most useful books on programming I’ve read – and I’m talking all languages. Buy the book if you work with PHP or planning to. I’ve written a new PHP book review that can be found at killersites.com. I’ve been out of the picture for a little while, but I’m about to get back into the swing of things and will be working on completing a few new PHP videos within the next week. I’ve managed to write a couple of PHP tutorials for Web Designer Magazine – the first article (on creating a contact form and simple survey with PHP) is coming out at the end of October. The next article due out in November, teaches OOP in PHP – that’s Object Oriented Programming for you new PHP nerds out there. So what makes this book different from the others? In a word – simplicity. This book, more than any other I’ve read on PHP, is geared toward the total beginner. All you need to know is HTML and you should be comfortable. The book opens up with a good chapter on installing PHP and MySQL on both Windows and MAC – many times this can the hardest part when learning this stuff! NOTE: I personally believe you don’t need to learn how to install PHP since 99% of us will be using a hosting company that already has PHP and MySQL installed. The author then does a good job in presenting the core concepts and techniques needed to effectively use PHP and MySQL using a series of easy to follow examples. Rather than presenting the specification, the material is presented in a real-world context. That is to say, you are taught with examples of task that are commonly needed in the real world. Besides being taught the details of PHP programming and MySQL adminstration, you also learn how to put together a PHP/MySQL dynamic website. So not only do you get the details, you also get a global picture of the process …how all the pieces fit together. A great beginners book to be sure and there is enough information for you to be able to start building simple database driven websites. Once completed though, I would then consider a more comprehensive book that will get you into more of the down and dirty details. PHP Hacks is essentially a collection of ‘bite-size’ PHP scripts that you can easily drop into your websites. Besides being able to use the hacks straight away in your projects, the PHP code/hacks are clearly explained making them good tutorials for learning how you might do something in PHP. Using AJAX with JSON – a php library that makes working with AJAX easy. PEAR hacks like Net-Geo to find out state and city locations of people. A good examination of PHP design patterns. Not exactly for beginners, but if you have an understanding of basic PHP you will be OK and you will learn a lot. This book is also good for programmers (from other languages) who want to get a good idea of what tools, libraries are available in the PHP world. Another good book from O’reilly. Co-written by the guy who invented PHP (Rasmus Lerdorf,) this is a must-buy book for anyone getting into PHP or web programming in general. What can I say; this book is so well written and to the point, that I found that the information seemed to just flow from the pages. This is not a book for someone just learning how to program; it is for everyone else though. Both programmers new to PHP, or PHP programmers with (at least) a basic understanding of PHP, will find this book to be very handy to have around. … instead it gives the best coverage of the core language I’ve ever read. Another great book from O’Reilly. This book targets beginners to PHP but NOT total beginners to code and programming – I think that certain explanations of the basic programming concepts, may confuse a some people. Doesn’t matter though, once you’ve done my free video tutorials (found on this site,) you will be able to breeze through this book. Besides the basics of PHP programming, the book does a good job teaching basic database theory and concepts – but not so much to bore you to death. Instead (like the rest of the book,) the coverage of database theory is just enough to get you going with MySQL. Not a bad book for people who have a little PHP knowledge … but if you are a total programming novice, you will need to get another book … or better yet, my php videos for novices! I don’t usually plug my own stuff … but what the heck. The thing that stands out for me, is the way the author is able to cover various PHP topics in a concise manner. He has also chosen topics that I think would interest most PHP programmers – they are practical. The section on string manipulation is very good. Great coverage on the powerful sprintf function – something you don’t see often. HTML form processing (chapter 5) shines. … though the book says that all you need to know is HTML, this is clearly not the case. Most web designers will have problems if they try to tackle this book from scratch. If you have a little PHP background, this is a good book to get. I’m happy to have it on my nerd-book shelves.